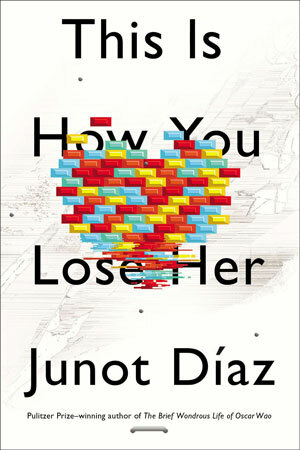 This Is How You Lose Her is Junot Díaz at his finest. Díaz’s newly released collection of short stories comes five years after the publication of his Pulitzer Prize-winning novel, The Brief Wondrous Life of Oscar Wao. Yunior, the skirt-chasing Dominican-American narrator who appears in The Brief Wondrous Life and Díaz’s 1997 book Drown is back for This Is How You Lose Her. The stories focus on love and heartbreak, as the title suggests, but also on what it means to be an immigrant in the U.S., have immigrant parents, and grow up in a poor, minority neighborhood. Although Díaz occasionally narrates from the perspective of other characters, the stories told by Yunior are the most powerful, especially “The Sun, the Moon, the Stars,” “The Pura Principle,” and “The Cheater’s Guide to Love.” Yunior is a complex character: he is a relentless womanizer, but he’s also the sci-fi nerd who falls hard for his girlfriends and regrets his dalliances for years afterward. Although sometimes we get frustrated at him for making the same stupid mistakes, he inevitably wins us over with his wit, honesty, and all-too-human fallibility. Although This Is How You Lose Her concentrates on romantic love and loss, some of the most poignant stories explore familial bonds and friendship. In “Nilda” and “The Pura Principle,” Yunior’s brother Rafa is terminally ill, yet in his frail state, he repeatedly rejects Yunior and his mother’s attempts to care for him. It’s an unusual depiction of a family’s struggle with sickness and death, striking for its portrayal of the failure of human connection to mitigate grief and suffering. “The Cheater’s Guide to Love,” a coming-of-age-of-the-artist story, is the perfect conclusion to This Is How You Lose Her. Yunior’s cheating costs him the love of his life, whom he refers to as “my ex.” As a coping mechanism, he becomes an obsessive exerciser, but he keeps getting injured; he tries to date other girls, but he is repeatedly spurned. He has moved from New York to white, homogenous Boston, where he is frequently the target of racism. Weakened physically, emotionally, and spiritually, and unable to get over the ex despite the passing of time, he finally turns to writing to give him a fresh star – in love and in life. Yunior is brutally honest in this story – he finally accepts that “the half-life of love is forever” – but also optimistic. We, the readers, finish the book feeling hopeful that like Yunior, we can also recover from our own errors and life’s unexpected challenges, and write a new chapter for ourselves.